Internal Combustion of Engines: A Detailed Introduction to the Thermodynamics of Spark and Compression Ignition Engines, Their Design and Development focuses on the design, development, and operations of spark and compression ignition engines. The book first describes internal combustion engines, including rotary, compression, and indirect or spark ignition engines. The publication then discusses basic thermodynamics and gas dynamics. Topics include first and second laws of thermodynamics; internal energy and enthalpy diagrams; gas mixtures and homocentric flow; and state equation. The text takes a look at air standard cycle and combustion in spark and compression ignition engines. Air standard cycle efficiencies; models for compression ignition combustion calculations; chemical thermodynamic models for normal combustion; and combustion-generated emissions are underscored. The publication also considers heat transfer in engines, including heat transfer in internal combustion and instantaneous heat transfer calculations. 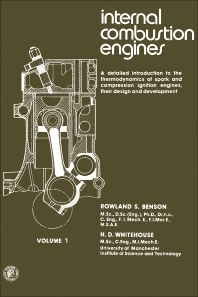 The book is a dependable reference for readers interested in spark and compression ignition engines.